“Hey vous ! Viens ici!” was yelled at me by some thirty-something hipster. I understood what he was saying. I speak zero French, but by the motion of his hand I realized he wants to speak to me. This late at night? Walking down a dark vacant street? I had no interest in what he wanted. I stopped and starred at him. I stroked the beard I had started growing on my last trek over here. I petted in slowly and repeatedly as if I was contemplating a Chuck Norris response. I then ran my hand in an upward choking motion from my Adam’s apple to the tip of my chin, then asked in my lowest-booming-bass, redneck-voice, “where might I get some whiskey this late at night hoss?” Silence was his answer. He flipped me off and resumed his chatter with his other hipster friends. 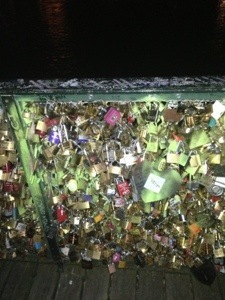 I encountered this on my twenty-five block trek to see if I could find the lock I left here at the first of March on the Louve bridge. After finding the marks that were graffitied on the top rail above where I placed the lock (as seen in my handy picture I took back then), I found it buried among a myriad of other locks. It was a bit rusted but it was there. 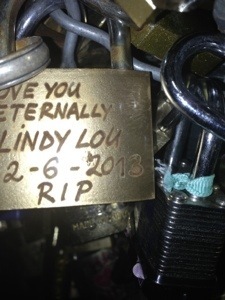 Man there have been 100’s, if not 1000’s of locks put on this section of fence over mine since I put Lindy’s on there. It made me feel happy, and comforted in a weird way to see it. It put me at peace that it was still there with my ring still hanging on it. It gives me a sense of joy knowing it will always be there anytime I return. 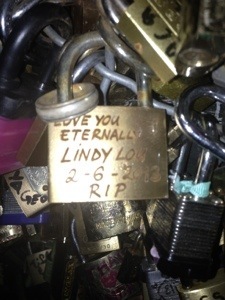 It’s as if I have a piece of Lindy waiting for me in the city of love, Paris. I will always look for it when I visit. It goes without words how much she is missed. Had a long but good day. Left Dallas at 5:05 p.m. yesterday (June 27th). Was happy to have a surprise direct flight to Paris. I boarded the plane and popped a Xanax so I could sleep the whole way. I wanted to be ready to see Paris and not spend the better part of the day in my hotel bed. Forty-five minutes after I popped it we pulled back up to the gate. “We are de-boarding the plane due to overheating issues” the intercom blared. Really? I was sound asleep! This ought to be fun. Still asleep I followed the leader like a zombie and got off the plane with the herd. Man I was hungry! Who knew Xanax gave you the munchies! A full plate of a two meat BBQ platter and 2 Dunkin donuts later we were re-boarding. Nine and half hours later, at 12:30 p.m Paris time, we were landing. I still slept like a baby….on a full stomach! 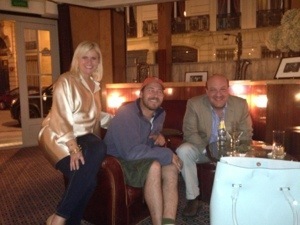 After the grueling stop-no, stop-n-go , stop-n-go hour + cab ride from CDG airport to Paris centre, I was sipping classic cocktails with my friend Carter in the 65 degree overcast Paris air while his wife Jill shopped. She joined us at the restaurant inside Ralph Lauren when she was done. So glad I was able to hang out with them all day. It made my visit back to Paris easier. They were here on coincidence. I consider Carter a good friend and great guy. 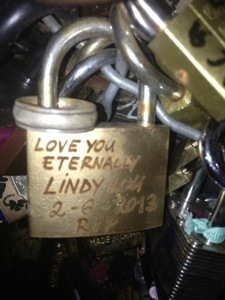 I met him through Lindy. He sold me her beautiful wedding ring. Carter, Jill and myself had really fun conversations; ate awesome Italian food; had fun people watching experiences at a really posh club; and retired fairly early…for me that is. Great evening. The cab dropped them off at their flat and it took me to my hotel in the Bastille district. I checked in. I dropped my back pack in my room on the sixth floor. I unpacked my new external battery pack and went went immediately walking. 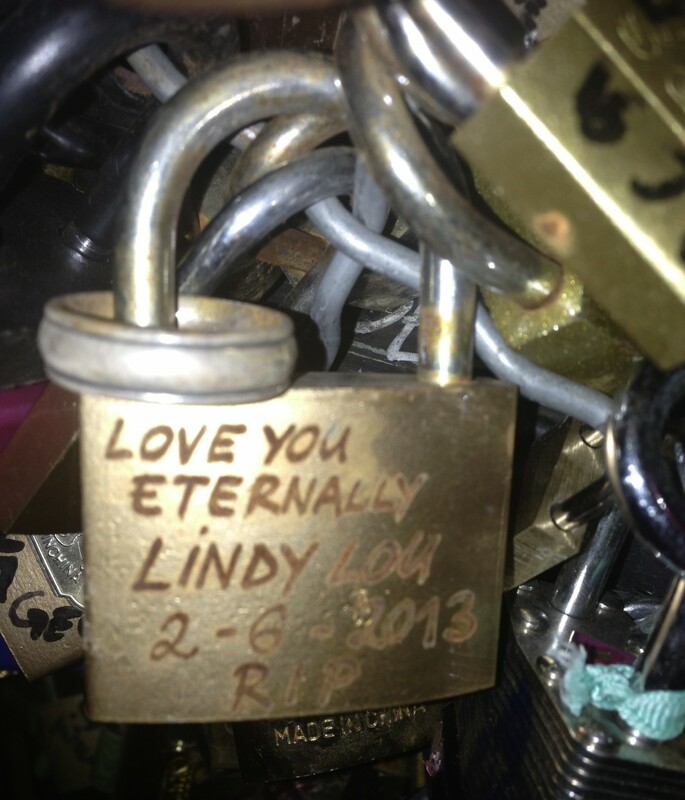 I walked in search of the lock, which as mentioned, I found it. Was shocked i was able to find the bridge between the Louve and Orsay so easily. I had some weird, intense deja vu though while walking down this Paris neighborhood side street at 4:41 am. I am slightly lost but not really. I start adding up the hours of sleep I will get-at best. I have severe anxiety over the sense of déjà vu that is overwhelming me. It seemed to stop me in my tracks. “I have been here before” I say out loud. In Paris staying at the exact hotel and on this exact street. I turn left one block and it goes away. Funny when that happens. Sweet dreams from Paris. Thanks for the prayers and well wishes. Exited to get in the mountains. ****Want a good read? I am listening to The Pilgrimage by Paulo Coelho. He is the writer of The Alchemist (great book). He wrote The Pilgrimage after he walked the Camino de Compostella. It’s a fictional book based on his journey of The Way. Posted on June 29, 2013 July 23, 2013 by michaelpaulcox	Bookmark the permalink.